Ok, so here’s the question that’s been playing on my mind today. 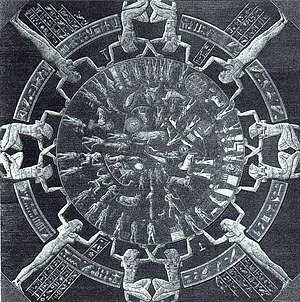 Is it a good thing or not that the original Dendera zodiac was chipped from the wall of the temple at some point during the nineteenth century by the early explorers of Egypt and now resides in Le Louvre in Paris? Would it not be better for it to have remained in situ in the wonderful Ptolemaic temple where it was first carved? I visited Dendera Temple yesterday. It’s an hour’s drive north along the desert road from Luxor; or it’s possible to take a boat trip if you want to make a whole day of it. The temple sits on the West Bank of the Nile, opposite the modern town of Qena. It’s quite simply stunning. A beautifully preserved temple, full of the chirping of hundreds of sparrows. 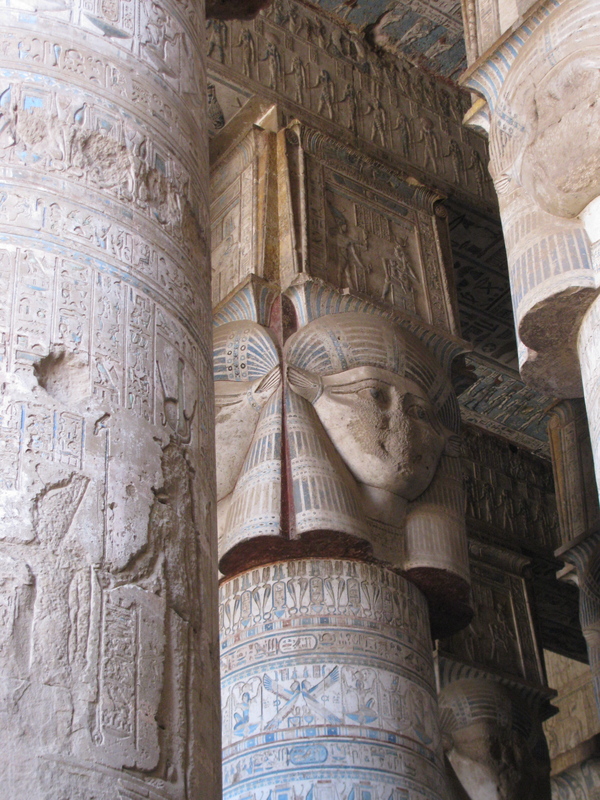 The tops of the columns in the Hypostyle Hall are unusual for having the Hathor-headed capital – still with original colours. It’s right up there with some of the other hugely impressive temples of ancient Egypt. 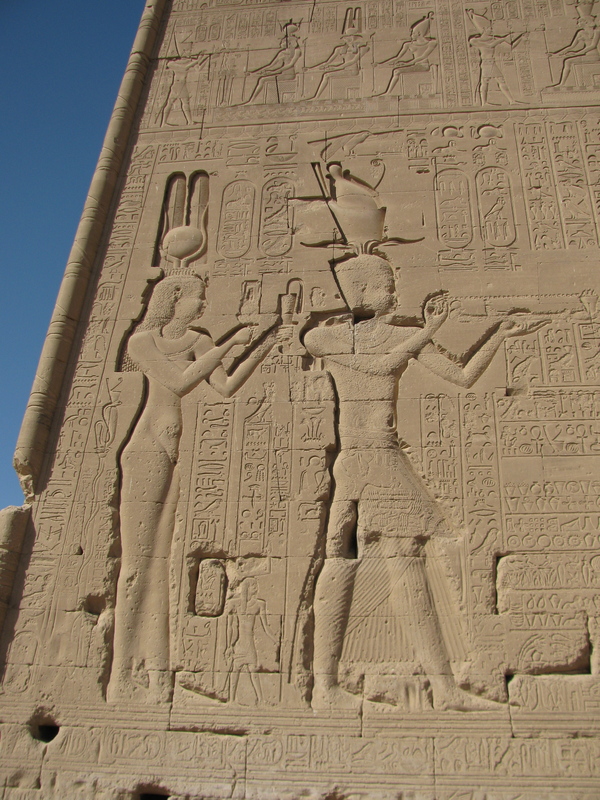 This temple was built towards the end of the Ptolemaic period, some two thousand years ago. There’s a huge carving on the back wall of Cleopatra with Caesar and their son Caesarian who was sadly never to assume his place at Pharaoh once the Roman Empire fully took charge after the joint suicide of Cleopatra and Mark Antony. A clean-up job has begun inside the temple. The roof is blackened from the centuries when the temple almost disappeared beneath the sands of time; and the old Bedoiuns used to camp out inside the temple walls, and build fires to keep warm and for their cooking pots. The smoke from these fires has blackened the roof with centuries’ worth of soot. The careful cleaning job is revealing a remarkable ceiling, beautifully painted and with its original colours still largely intact. This picture looks like it’s half in the shadow and half in the light. Actually, it shows half the ceiling – cleaned – and the other half still blackened with dirt. But back to the question that’s been bugging me. The trouble is, I can argue it both ways. The museums of the world – notably the British Museum in London, Metropolitan in New York, Le Louvre in Paris and the Turin Museum in Italy – are filled with treasures taken from Egypt in those early days of exploration before the Egyptian Antiquities Service put a stop to it in the early twentieth century. My heart tells me that Egypt’s treasures should have remained in Egypt. I would love to visit the temples and see them filled with their statues and original wall carvings. I can’t help but feel Egypt has been robbed of some of its fabulous heritage. But it’s also a simple fact that some people will never get the opportunity to travel to Egypt – and to see the fabulous statuary and artefacts in the museums of the world is better than never seeing them at all. And perhaps this is what inspires many people to come to Egypt in the first place. So it’s a circular argument in the end. 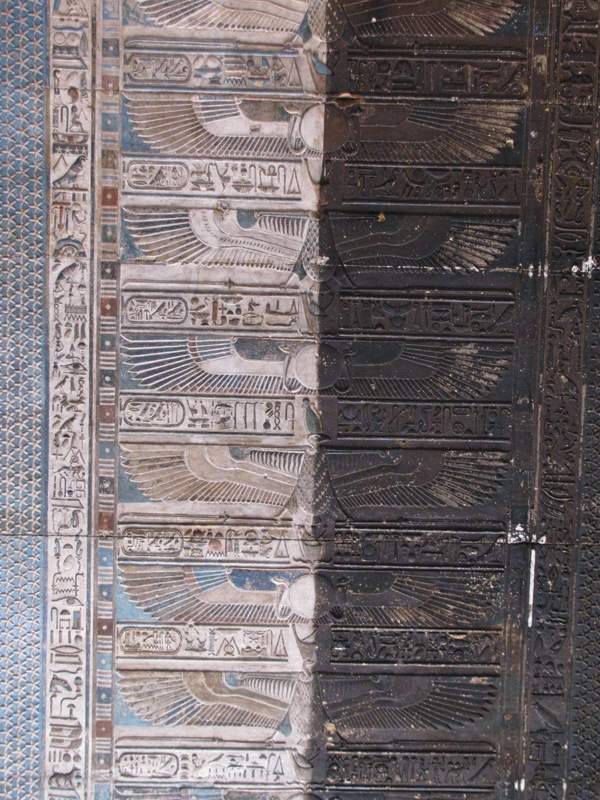 But standing in Dendera temple yesterday, and looking at the huge metre-square replica of the zodiac on the roof of the dark little chapel where the original once resided; I couldn’t help but question the ethics of those original explorers who chipped this remarkable carving off the wall and shipped it to Europe. Posted on April 12, 2013 by Fiona Deal. This entry was posted in ancient Egypt, Egypt, History, Travel and tagged Cleopatra, Dendera, Dendera zodiac, egypt, Hathor, Luxor. Bookmark the permalink.